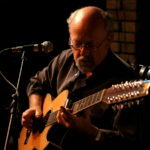 DAVID ESSIG was introduced to Canadian audiences in 1971 as a “talented newcomer” at the legendary Mariposa Folk Festival. Now, nearly 50 years later, he continues to pursue an international career as one of Canada’s finest roots music performers. He has appeared at every major folk festival in Canada and at concerts throughout the world.